Rising cyber-attacks threats along with the growing importance of data security & privacy is certain to drive virtual private network market growth in the forthcoming years. Lately, the use of digital payment platforms and internet banking services has increased rapidly which has further encouraged cybercriminals to commit digital thefts and frauds. For instance, in August 2018, a cybercrime case reportedly surfaced where hackers managed to withdraw over Rs. 94 crore by initiating a malware attack on the Pune-based Cosmos Bank server, eventually cloning thousands of the debit cards over a period of two days. Using a virtual private network (VPN) organizations can attain online privacy and anonymity by creating a private network from a public internet connection. The technology efficiently masks the user’s internet protocol (IP) address making online actions virtually untraceable. VPN services also establish a secure and encrypted connection to provide users with greater privacy than a secured Wi-Fi hotspot, thereby expanding the scope of virtual private network market. Affordable mobile and wireless devices and cheaper and faster internet and Wi-Fi plans within homes and organizations will emerge as two of the most pivotal factor driving VPN market. Several private and public organizations are now using mobile devices, such as smartphones, laptops and tablets for business related applications such as sales, marketing, business relations and transactions. Surfing the web or transacting on an unsecured Wi-Fi network could make businesses unsafe as sensitive and confidential data could be visible by hackers or cybercriminals. For instance, on 22nd January 2019, Belgian metal manufacturer, Nyrstar was hit by a cyber-attack. Reportedly, the company, in a bid to contain the issue, had to shut down some of its IT systems, including email. The rising prominence of the internet and the massive penetration of smart electronic components thus demand the necessity of a secure network, impacting VPN industry trends. Cloud-based VPN provides security and compliance to networks that have transitioned to the public cloud, in addition to delivering globally available VPN access to end users and subscribers through a cloud platform over the public Internet. The commercial application sectors comprising BFSI, healthcare, IT & Telecom, utility, manufacturing, and government will certainly experience added security and privacy owning to cloud VPN, thereby influencing the industry share. Citing an instance, the healthcare sector embraces VPN technology to protect the patient’s sensitive information from unauthorized access. The rapid shift toward virtual applications and the surge in the demand for cloud services will thus drive the cloud VPN market. Powered by rising data privacy and security concerns, cloud VPN industry share is anticipated to record a CAGR of 21% over 2018-2024. 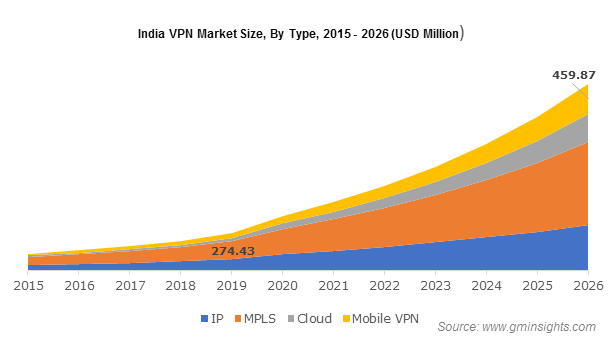 Escalating sales of smartphones and IP devices owing to rapid technological advancements across the consumer electronics and IT sectors in the Asia Pacific will majorly upscale the demand for VPN market in the region. Indeed, smartphones are the most vulnerable to cyber-attacks among most consumer products. Smartphone manufacturers in the region, in accordance, are now offering in-built VPN software to offer added security and privacy to customers, enumerating growth opportunities for the regional and overseas VPN industry contenders. Growing cases of cyber-attacks across the Asia Pacific have further encouraged businesses and organizations to incorporate the technology in their private networks. According to reliable estimates by the Computer Emergency Response Team (CERT) in India, there were about 50,000 cyberattacks cases in the nation in the year 2016 while around 49,000 cases were registered in 2015. These figures aptly speculate the much-needed demand for VPN technology in the region, that would in turn help propel APAC VPN industry trends. The key players operating in the VPN market include Avast Software s.r.o, Checkpoint Software Technologies, Citrix Systems, Inc., Cisco Systems, Inc., Cyber Ghost, Express VPN International Ltd., IBM Corporation, Juniper Networks, Inc., Opera Software and WatchGuard Technologies, Inc. VPN providers, it has been observed, are providing their customers with discounts and special offers to expand their customer base. For instance, in December 2018, ExpressVPN announced its Christmas plan that offered a 12-month subscription plan down to $6.67 per month with additional 3 months, allowing users with a saving of 49% on prior plan. Rising rivalry has also encouraged providers to form alliances with similar companies which will further augment the growth of VPN industry.